Although Queen Victoria could never visit India, she took special interest in it as the Empress of India and amongst all towns in the Himalayas, Nainital. Some Himalayan mystics believe that Queen Victoria was a European reincarnation of the goddess Nanda (as also the Tibetan goddess Tara) and her great great grand daughter Queen Elizabeth may be a divine or angelic reincarnation too, for goddesses when they reincarnate on Earth have often done so as royalty and in current times there is none more supreme than Her Majesty amongst royalty and she has all the attributes of a divine personality. 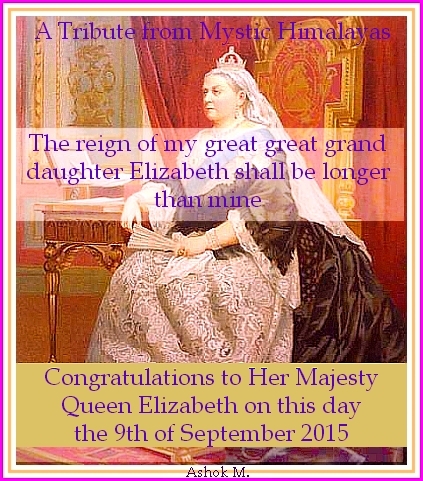 Today she became the longest reigning British Monarch in a thousand years. The reason for a European reincarnation of a Himalayan goddess are discussed at length in the author's book - The Babaji Affair - available at all major online outlets including Amazon. As we move through life we run into people whose words offend us deeply, others whose words are pleasant and sweet and most in mixed formats. That is what creates a character different from a bland vegetable. 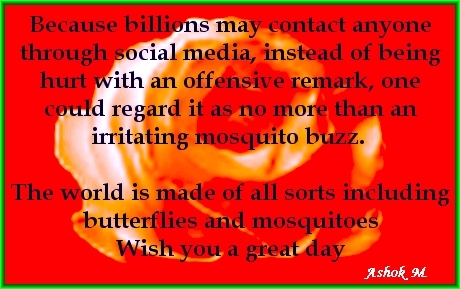 If we are unable to tolerate offensive words of someone we know or meet, we can minimize communications with such persons and even cut off completely in the case maxima. A similar thing can be done for electronic communications too, through various means known to those familiar with its use in places like social media through use of block, private etc.